Steelers Trade With Jacksonville For K Josh Scobee | "IT'S A STEELERS WORLD"! First Shaun Suisham goes down..entered Garrett Hartley. Only to have Hartley go down this past Saturday versus the Buffalo Bills..short search for a new kicker ended earlier today. Mark Kaloby of the Pittsburgh Tribune Sports reports that the Pittsburgh Steelers have traded for Jacksonville Jaguars kicker, Josh Scobee. Making him the third kicker in the position the team desperately needed to fill. 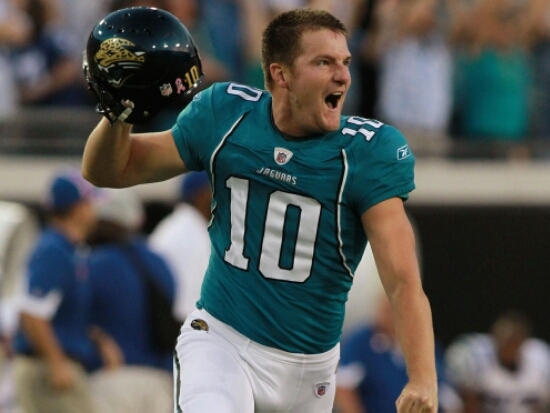 The 33 year old Scobee spent 11 seasons with the Jaguars, making 81 percent of his kicks over his career. But recently ended up losing his job in training camp battle with rookie Jason Myers. Entering his final year of his contract, Scobee was the franchise leader with 235 field goals and 1,022 points . Making 20 of 26 kicks last year with three of those misses being from 50 yards or longer and another was blocked. Scobee had 37 touchbacks last year with and only 20 kicks returned, and so far this preseason has 4 out of 5 touchbacks. only 20 kicks returned. Details of the trade have not yet to be released.